First generation nests are seldom as numerous or as large in size as those produced by the second generation. Female moths often lay their eggs on or near the nests from which they developed, thus second generation caterpillars expand the nests once occupied by first generation caterpillars. The second generation nests typically reach their maximum size in the fall which accounts for the common name. Fall webworms have two distinct biotypes named for the color of their head capsules: black-headed and red-headed. Caterpillars of both types are very hairy, but differ in body coloration, nesting behavior, dates for spring adult emergence, and to some extent, host preferences. The black-headed type emerges earlier in the season and tends to produce small, wispy nests that envelop only a dozen or so leaves. 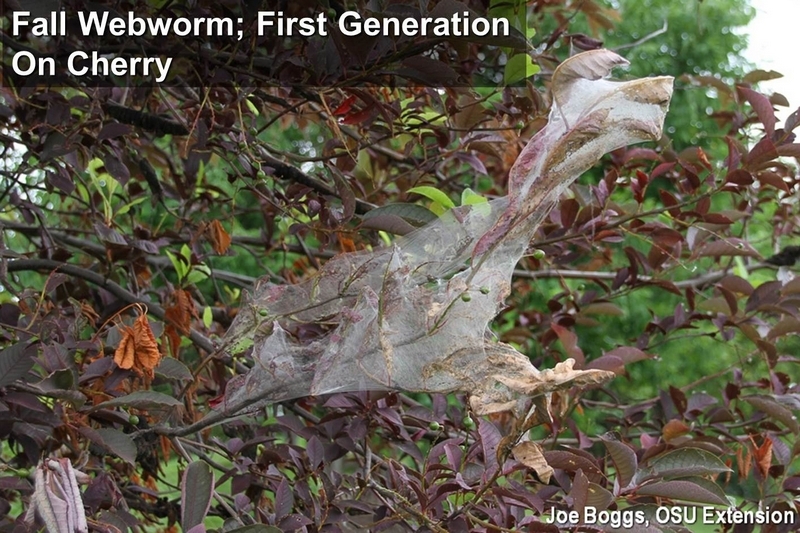 Red-headed fall webworm caterpillars can produce some truly spectacular multilayered nests enveloping dozens of leaves at the ends of branches. This biotype is the more damaging of the two and is commonly found in the eastern part of Ohio. The black-headed biotype is common in the central and western parts of the state.